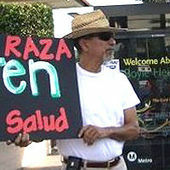 Ismael Parra is an Arizona/Southern California activist. Lives in Los Angeles, California. What do hip hop and labor have in common? If you ask the Los Angeles-based hip hop artists the Inner City Dwellers, hip hop and labor have a similar message. Labor is the voice for the working class and community hip hop is the voice for the disenfranchised and working poor. According to Fuerza Mexica (Cesar Castrejon), one of the Inner City Dwellers said "We are artists who won't turn our backs on workers and we see labor as an organization that won't turn its back on the workers." The People's World luncheon honoring workers in the struggle was held March 20 at the Clean Carwash Workers Center, home of the Carwasheros organizing campaign in South Central Los Angeles. The Inner City Dwellers opened the People's World luncheon in Los Angeles with a spirited bi-lingual rap about the plight of hard working families. Their message and performance is a "Love song to the working people," according to Andres Rivera, one of three members performing at the event. Rivera, Jorge Cutera along with Cesar Castrejon make up this community-based hip hop group. This hip hop performance set the tone for the entire afternoon. The People's World event ended with another wonderful cultural presentation by Ismael Parra, a musician and union/community activist. The Inner City Dwellers will be releasing an all-Spanish hip hop CD in the fall. Those invited to participate on on Facebook included Ismael Parra. Arturo Cambron July 2, 2016 near Los Angeles, CA. Solidaridad por siempre. Buenos camaradas. — with Ismael Parra, Rossana Cambron and Cheno Cruz. This page was last modified on 15 December 2018, at 23:43.